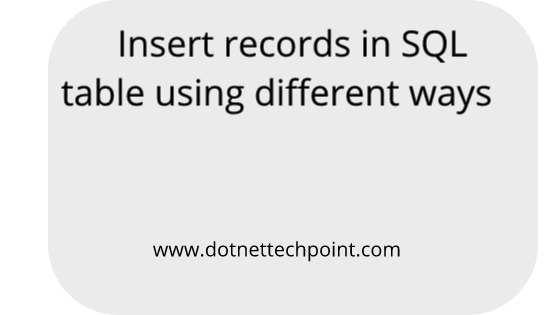 In this article we will learn how to insert records in Sql table using different way. Let's start it with practically. Create a database which name is STUDENTDEMO. Write query for insert the records in SQL table using different way. First way: For insert the records in SQL table. It means for insert multiple records in a table we will write whole statement again and again. In second way don't need to write insert into table name and its fields use always values with comma separated. In third way don’t write whole statement like insert into table use always union all and select clause then your record inserted successfully. ( dotnettechpoint.com ) for get latest videos. You can also also watch from here. I hope this article helps you, please provide me with the feedback for my article with videos.